Are holiday homes a good investment? If you are looking for a buy-to-let investment with high returns, a luxury holiday home is the ideal investment. UK tourism is booming and holidaymakers will pay more than £1,000 for a 7-night stay in a luxury holiday home with hot tub. Currently, demand for luxury holiday homes far outstrips supply so now is the time to capitalise on the popularity of UK ‘staycations’ and invest in a holiday home. Holiday lets have been largely unaffected by the recent changes in the law which has increased tax on buy-to-let properties. Plus, holiday homes benefit from Furnished Holiday Let tax relief making holiday lets a better financial option compared to traditional buy-to-let. Of course, purchasing a holiday home also means you own a property which you and your family can also enjoy. Escape to the countryside during the summer holidays or spend a winter weekend relaxing in your hot tub, then let your property earn you money the rest of the year. 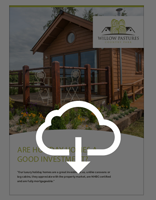 Download our Ultimate Guide to Buying a Holiday Home to read more about why a holiday home is a good investment.